Trying to figure out that whole virtual assistant thing? Tags: Virtual assistant, outsourcing, too busy, productivity, getting more done. You do a lot of things anyone could do, and not enough of what only you can do. You get a lot done, but you want to get more done. You hired a virtual assistant, and things went poorly. You have a virtual assistant, and things aren’t going well. I read The Four Hour Workweek by Tim Ferriss years ago and it changed my life. But in the book Tim talks about outsourcing many of your daily tasks to a virtual assistant, and I found myself asking “Yeah, but how exactly do I do that?” Over the years I’ve tried outsourcing to virtual assistants, and sometimes it has worked for certain tasks and other times it has failed miserably. Whenever I had a failure with a VA I would think back to Tim’s book and think about how I wish he had written in detail exactly how he managed things. 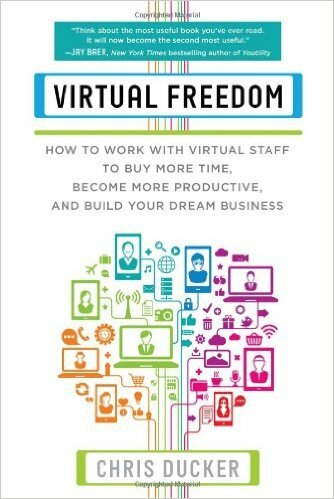 Virtual Freedom is the book I was waiting for all these years. This book is the manual on how to build a business, or thrive in your day job, by hiring and managing virtual assistants. More than that, it’s a great management book. Many books are heavy on strategy and light on tactics–the details of how to actually do stuff, but in this book author Chris Ducker gets into the nitty gritty, telling you how to communicate with assistants, where people usually run into problems outsourcing tasks, how to find assistants, what to pay them, etc. Even if you never hire a virtual assistant but simply run a business with a few employees, this is still a valuable resource.